SALISBURY, Md. 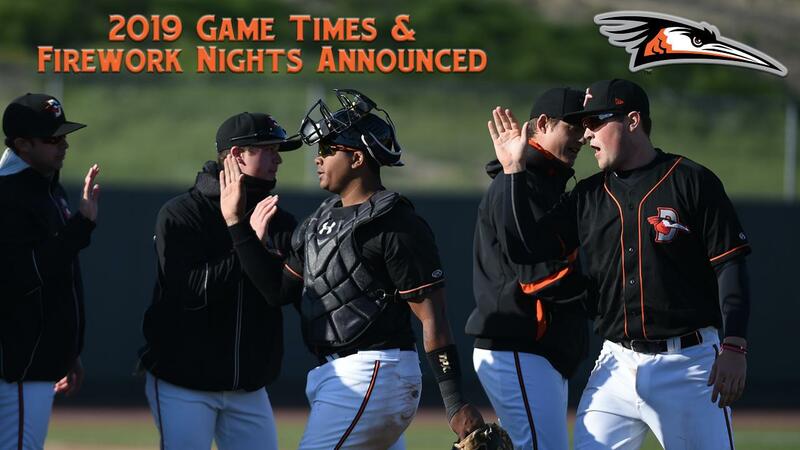 -- The Delmarva Shorebirds have released game times and fireworks dates for their 2019 home schedule, which will begin at Arthur W. Perdue Stadium on Thursday, April 11th against the Lakewood BlueClaws at 7:05 PM. The majority of Monday-Saturday games will feature 7:05 PM start times, similar to previous seasons. Sunday contests in the first half of the season will begin at 2:05 PM. Sunday games will change to 5:05 PM starting on July 7th against the Hagerstown Suns and remain that way until the conclusion of the season. The first Field of Dreams game, presented by Chesapeake Health Care, will take place on Wednesday, April 17th. The remaining two Field of Dreams game days will take place on Thursday, May 9th, and Wednesday, May 22nd. All three of which will have a 10:35 AM first pitch to accommodate local students, schools, and other groups. Delmarva will also be at home on Thursday, the 4th of July for a special 6:05 PM start against the Hagerstown Suns. Other unique start times include Mountaire Faith and Family Night on Saturday, June 8th featuring a 6:35 PM start time and Memorial Day on Monday, May 27th with a 2:05 PM first pitch. The 2019 season will conclude at Arthur W. Perdue Stadium with a 2:05 p.m. game against the Kannapolis Intimidators on Monday, September 2nd for Labor Day. The Shorebirds will be hosting 15 Q105 fireworks shows in 2019, including all 11 Saturday home games. The dates for all Shorebirds fireworks shows are Opening Night, April 11th, April 13th, April 27th presented by Dr. Susan Vickers at Seaside Smiles, May 11th, May 25th, June 7th presented by Perdue Foods, June 8th, June 15th, July 4th, July 6th, July 13th presented by Wor-Wic Community College, July 27th presented by Market Street Inn and MoJo's, August 9th, August 10th presented by Mountaire Farms, and August 31st. "Our staff has worked hard to plan these game times and fireworks dates so that Shorebirds fans can plan their nine inning vacations and group outings for 2019 at Arthur W. Perdue Stadium," said Shorebirds General Manager, Chris Bitters. You can see the full printable 2019 schedule with fireworks and game times HERE. Ticket plans and group outings for the 2019 season are on sale now. For more information, contact the Shorebirds at 410-219-3112 or visit theshorebirds.com.